The objective of this Blog is to help every Functional consultant and Architect to understand the changing landscape of Business and corresponding IT solutions. In this era of Industry 4.0, one of the key concepts enunciated is “Smart Services”. In this context, SAP has articulated, building “Intelligent Enterprise” is the way forward for Customers to overcome competition. Accordingly, SAP has built “Leonardo” as a set of “intelligent technologies”, to build such enterprise, using “Business Model Innovation”. 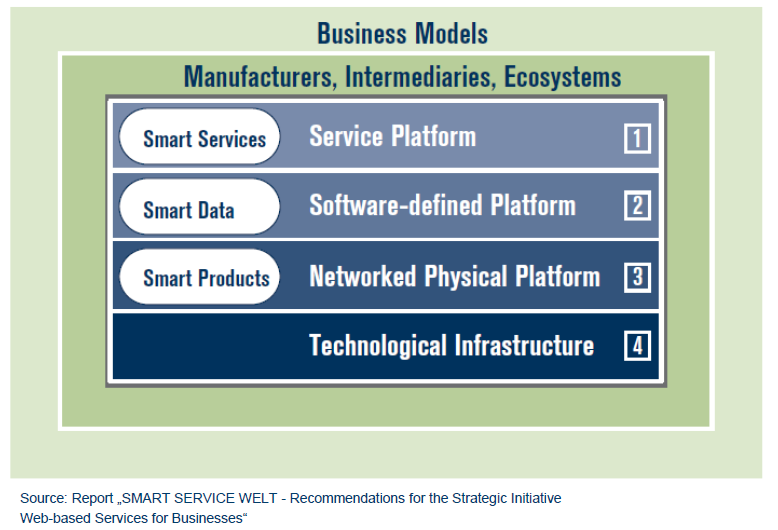 “Smart Services” are the building blocks of “Intelligent Enterprise” to come up with “Business Model Innovation”. Since “Smart Service” and “Business Model Innovation” are new to many, they are explained in brief, in the following sections. Simply stated, BMI is the development of new and unique way of doing business, which brings value for all its participants, by leveraging data and technologies (like IoT). It sounds easy on the face of it, but coming up with a new business model for an existing business is a challenging exercise and transforming from old model to new is much more challenging. AirBnB is a great example of how hospitality industry was disrupted without owning a single hotel/real estate (which was core for the business). There are labs and institutions like BMILab, offer help to build new business models. To highlight the number of business model disruptions which shook the traditional industries, look at the Tube Map of BMI Disruptions by BMI Lab, in Exhibit-1 below. For example, a business model of “Subscription” (purple line in diagram) was adopted by Netflix (media rentals in 1999), Salesforce (software as service in 1999) , SAP Business ByDesign (software as service in 2007), One Dollar Shave Club (Product as service in 2012) and so on. One can get the latest Tube Map here. As defined by Fraunhofer Institute, “Smart Services” are a set of conventional and digital services, that utilize data as their foundation and are enabled by technology platforms. The acatech academy has come up with a framework, to put smart services and Business Models in a context for better understanding. It consists of 4 layers as shown in Exhibit-2. The technological Infrastructure is core, provided by hardware manufacturers. The “Smart Products” are “intelligent” products, which works on the field, gathering data while in operation. An example is autonomous car or automated guided vehicle in factory. The “Smart Data” is an “insight” generated from operating data gathered from smart products using techniques like real-time analytics, Machine Learning etc. This is typically generated from software defined Platform. An example of such platform is Siemens Mindsphere. The “Smart Services” are the offerings, made available to consumers/customers, using smart data and smart products. They are offered typically via “Service Platform”. For example “Amazon Website” is a service platform in which we use “smart services” like “searching a product” , “Order a product”, “Pay for the product”, “Track Product Delivery” and so on. Sometimes “Bots” in website(service platform) also provides services (answering user queries). Smart Services are the new building blocks and can be fruitfully used to build new Business Models. For example, using smart services, one can be building pricing models like usage based pricing (example: amazon web services charging customer for active time of usage of hardware instances) or output based pricing (example: photo copy service providers are charged based on number of sheets photocopied ) and so on . It is also possible to build competitors services within one’s own service (example: apple pay, charging customer for in-app purchases and sharing it with app creators). These are just examples and many such possibilities exist. 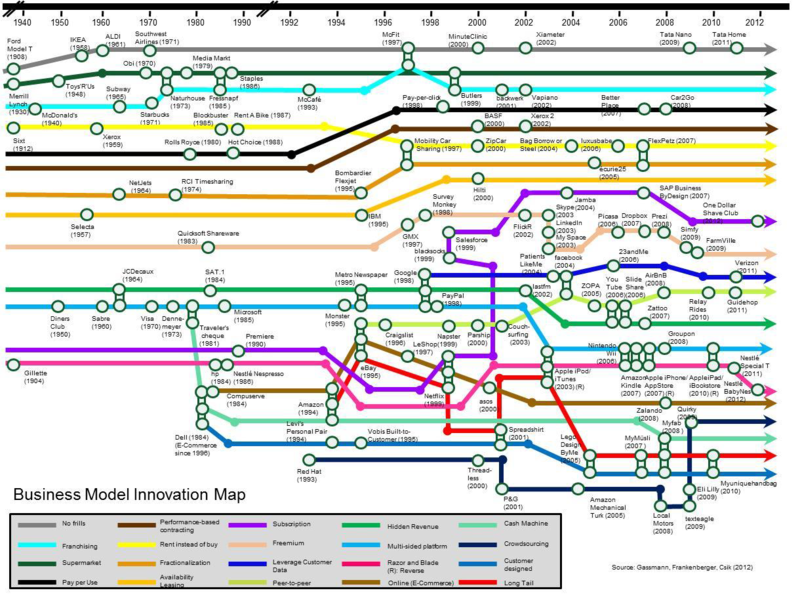 The BMI Lab Tube Map mentioned earlier is a great resource to explore how such adoptions have happened. Let us look at few use cases in vogue, to understand it better. Karcher, a German cleaning product company, traditionally selling cleaning machines to customer. It has built a new business service “Fleet Management” for its product, using “Smart Services” and BMI. The Fleet Management service is used by independent service companies, supporting Karcher’s customers. This has helped Karcher to build a greater customer loyalty, new source of revenue from “Fleet Management” service and also revenue from spare part sales and so on. The Retail giant Carrefour has built new services for enhancing customer shopping experience,(in its retail stores) using Philips LED indoor positioning technology. Here again, smart services and BMI have played a key role in opening up new possibilities like customer specific sales promotion in real time shopping. Pregis was a company selling Packaging materials and Packing solutions as products. They transformed themselves to a company selling “Packaging as a Service”. This means, Pregis manages the entire supply chain of monitoring demand for packing material at customer end, supplying them at the right time and ensuring the packing doesn’t stop anytime. The customer pays Pregis for the Packing materials consumed ! This is possible only because of “Smart Services” and Business Model Innovation by Pregis. SAP offers, SAP Leonardo as a suite of “Intelligent Technologies”, consisting of IoT, Machine Learning, Block chain, Big Data and so on. Each one of them, is a great tool to build “Smart Services” and bring in Business Model Innovation, relevant in their Industry. Many of the customers of SAP, like Karcher and Pregis have successfully adopted them. One can refer to the Blog on SAP Leonardo, published earlier for more info. In the era of Industry 4.0, SAP Functional Consultant has the opportunity to play a greater role of Business Model Innovation Architect, by helping customer build smart services. He/she can use his/her abilities to analyse, recommend, proto-type and demonstrate new business model by harnessing his process knowledge, functional knowledge and creativity. It is an exciting time we are living in, more so as an SAP Expert !